It’s not you, it’s me. For as long as I can remember you only support women on the left? You know, the Dancing Vaginas, Punch-that-card-Hillary-until-Obama-was-the-chosen-one, Sandra-astroturf-Fluke and your deafening silence on the Gosnell Torture Chamber for poor minority women. Yeah, for starters. You are part of the reason I left the left. Hypocrisy makes my head hurt. Your support of whatever Obama supports makes my head explode. But hey, keeping women stupid and on your side is all that matters, right? Send me a sign, pressure Obama to stop supporting icky rapey men with our tax money, here and in any other country we “aid”. You just might win me back. Or Clinton blaming Bush I ? 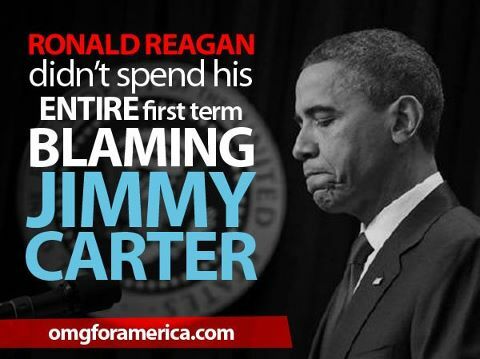 Or Bush II blaming Clinton? Martin Luther King Day, 2012, an appropriate message to our President. I was born in the inner city of Atlanta in 1961, when segregation was still rife, at a time when I would have been barred from visiting the very beaches that make up part of the congressional district I so proudly represent. How proud he would have been on that November Tuesday in 2008 when Barack Obama was elected the 44th President of the United States. Clearly, Dr. King’s dream had come true. White voters across America had judged our President by the content of his character, not the color of his skin, and elected a man of color, whose very lineage with a black African father and white American mother, was a literal manifestation of the figurative melting pot of these United States. The inauguration of our first black President, the highest office in the land, and perhaps the world’s most powerful office, clearly demonstrated to the world that race need not be a hindrance to success and achievement in America. The fact that Barack Obama won the largest share of white support of any Democrat in a two-man race since 1976 indicated the lion’s share of these voters made their decision based on his character, his vision of hope and change, and his ability to relate with everyday Americans. Still, let us not ignore that white Democrats aren’t the only voters who are capable of making a decision based on character rather than color. In the 2010 election cycle, 42 black Republicans were vying for seats in the House of Representatives, and 14 of them made it to the general election. Two of those candidates, myself as well as Tim Scott from South Carolina, carried that success all the way to the House of Representatives. I represent a Congressional District where more than 90 percent of my constituents are not black. A powerful movement of respect for black conservatism is brewing in this country, and Dr. Martin Luther King, Jr. would be proud of it. With all of this progress, why is it that we continue to hear charges of racism emanating from the left, and most disturbingly, from the White House itself? It seems anytime there is criticism of the President or any of his black members of his administration, such as Attorney General Eric Holder, that criticism is decried as racist. Mr. Holder recently said of his critics, “This is a way to get at the president because of the way I can be identified with him, both due to the nature of our relationship and, you know, the fact that we’re both African-American.” In other words, he insinuated Republicans — along with Conservatives and Tea Party members — are incapable of judging anyone solely by their character, something I take very personally. Mr. Holder and others need to know, the criticism of the President is not of his person, but of his policies, which have clearly failed our nation–and most tragically of all in this supposedly post-racial period –have failed the black community. As of December 2011, black unemployment remained in double digits, nearly double the national average for men at 16.4 percent, and 14.1 percent for women. According to a Washington Post poll in September 2011, the proportion of black Americans with a “strongly positive” view of President Obama has slipped from 83 percent to 58 percent. It would obviously be absurd to say the black community’s changing view of President Obama is racially biased, so how can one make the same claim about white members opposing his policies? As we proceed into this general election cycle, it would be a disgrace if Mr. Holder’s comment is the first salvo in the upcoming campaign to deflect honest assessment of the President’s performance in office. This campaign must be about ideas, policy and the direction of this country, and the President must not hide behind a curtain of so-called racial bias. All Americans, black or white – and every shade in between – must be allowed to voice their opinions, level their criticisms and engage in candid discussion without fear of being labeled “racist” simply because of the color of their skin. This is precisely what Dr. Martin Luther King spoke of so eloquently, and what we celebrate today. Please visit Congressman West’s official website at http://west.house.gov/ and meet the man who stands up to this bully administration. 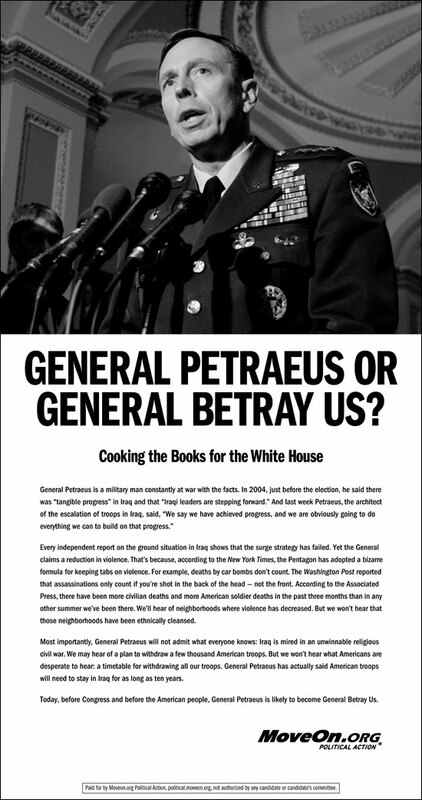 2007: MoveOn, General Petraeus and Obama, Oh My! MoveOn Scrubs “General Betray Us” Page From Website . . . Flashback to 2007, Obama Skipped Senate Vote to Condemn MoveOn . 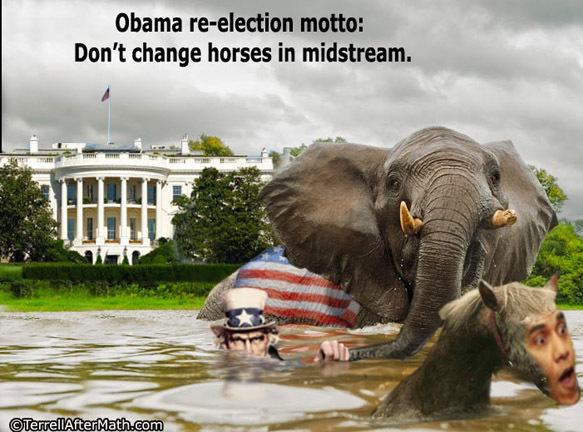 . .
Obama touted the group’s first-ever presidential endorsement in a statement released by MoveOn. Heck of a job Barry. “Our members’ endorsement of Senator Obama is a clear call for a new America at this critical moment in history,” wrote Eli Pariser, MoveOn.org’s executive director in the statement. Full disclosure: I was an activist member of MoveOn until their attack on General Petraeus with the belief politicians, not the troops, should be held accountable for war strategy. Obama, “I’m the Boss of You”, proved that with the firing of General McChrystal. As they say in elementary school, ” he started it” ! Unfortunately, we’re not on a school playground 😦 God Help America. THIS is why General McChrystal and his staff mocked Obama and Biden, et al … because THIS White House trashed our military in leaks to the leftist Jonathan Alter, who used their quotes in his book … which was intended to make the military look bad. This is NOT how a commander-in-chief is supposed to conduct himself. You can read Jonathan Alter’s words here. From The Promise: President Obama, Year One, by Jonathan Alter. To be published on May 18 by Simon & Schuster, Inc. © 2010 by Jonathan Alter. I can’t wait for the movie 🙂 Like “W” on steroids. It should star Michael Richards, sadly, he already has his “racist” street cred. <—-*warning* adult language content at this link. May be disturbing to the sensitive.